The US has been seeking a deeper defence relationships with India for years. 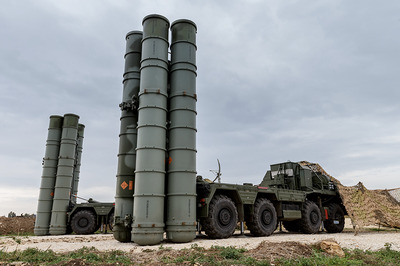 The latest hang-up: US officials are disappointed with India’s recent purchase of Russia’s S-400 air-defence system and that it may hinder future cooperation. Lawyers and policy and technical experts from the US Defence Department are in New Delhi this week, meeting with Indian officials to discuss a military-communications agreement that would boost the interoperability of the two countries’ armed forces. Russia has long been India’s main weapons supplier. Delhi worked with Moscow to develop the BrahMos anti-ship and land-attack cruise missile, and India also fields Russia’s S-300 air-defence system. India signed a $US6 billion deal with Moscow in late 2016, agreeing to lease a Russian-made nuclear submarine, to buy four Russian frigates, to purchase the advanced S-400 air-defence missile system, and to set up a joint venture with a Russian firm to produce military helicopters. India’s Defence Ministry is concerned that many of its Russian-made weapons, as well as its indigenous weapons systems, will not be compatible with Comcasa, according to The Indian Express, which also reports that defence officials are wary of US intrusions into their military communications systems. The US has been seeking deeper relations with India for years. Delhi has bought $US15 billion worth of US arms since 2008, and the US recently renamed US Pacific Command as US Indo-Pacific Command in recognition of India’s growing role in the region. India sees the S-400 as a way to increase its air defences, especially amid its growing rivalry with China. But its purchase has been an issue for Washington. Delhi has said it will go ahead with the purchase of the missile system, despite the recent Countering America’s Adversaries Through Sanctions Act, which aims to deter foreign individuals and entities from doing business with Russia’s defence and intelligence sectors. India reportedly wants an exception to CAATSA for its defence deals with Russia and plans to raise the issue during the 2+2 dialogue meeting. US Defence Secretary Jim Mattis has told Congress that “national security exceptions” must be made to CAATSA, which went into effect in January. “We only need to look at India, Vietnam and some others to recognise that eventually we’re going to penalise ourselves” by pursuing strict adherence to CAATSA, Mattis told senators in April. “Indonesia, for example, is in the same situation – trying to shift to more of our aeroplanes, our systems, but they have got to do something to keep their legacy military going,” Mattis added.